I had the opportunity to check out the “Iron Man Tech” exhibit at Innovations at Disneyland in light of the upcoming Iron Man 3 movie set to hit theaters on May 3, 2013. I was able to walk right in and look at the Iron Man suits.. However, there was a long line about 45 minutes to wait to try on the virtual suit. You stand on a tech looking circular pad and follow Jarvis’ instructions. 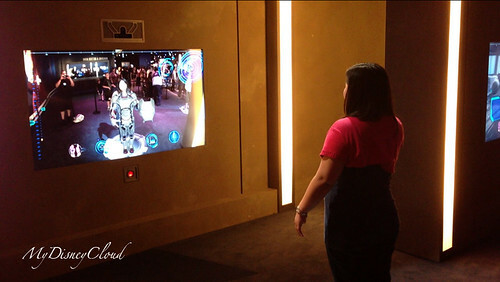 The virtual simulator was able to configure on the screen the Iron Man suit to my body shape. It was very innovative, and I’m surprised that the program was able to find the different heights from people. There was a little boy who tried on the suit and even made Iron Man dance. I loved the ambiance of the area, it really kept to the Iron Man theme and even had Jarvis talking about the suits. Very cool. Would I recommend that you try it and see? I don’t see why not– after all, who knows when the exhibit will stay up at Disneyland. Iron Man props straight from the movie exhibited at Iron Man Tech. 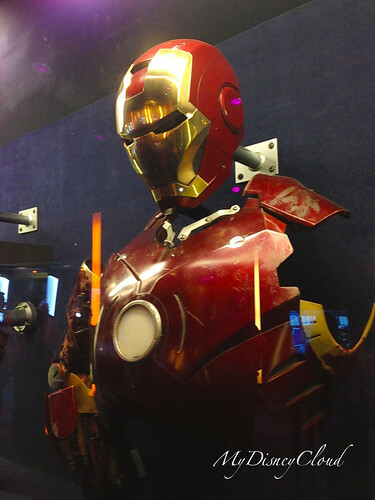 This entry was posted in Disneyland, General and tagged disneyland, iron man tech, iron tech, mark, stark industries, suits, tony stark by JNYFAV. Bookmark the permalink.